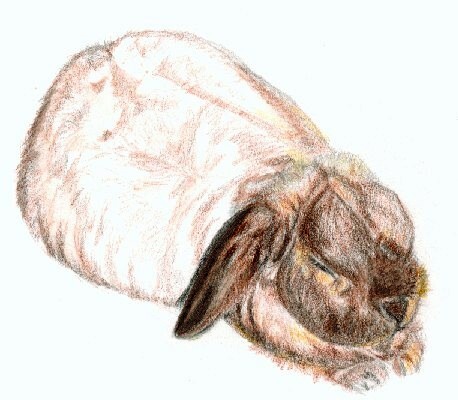 I have decided not to have another rabbit after Honey & perhaps this poem I wrote below says everything I need to about a most beautiful Dwarf Lop-eared rabbit, who was born on 9th May 1993, came to live with us on 20th June 1993 when he was seven weeks old & was put to sleep at home on 18th October 2002 at 10.45 am. He was innocent & simple, calm & happy. I loved him totally & miss him dreadfully. flick joy into air brimming with sun. when night-time and hutch beckoned. brings immunity from pain to deepest sleep. "It's the last kindness I can give him, isn't it?" resting on familiar blanket on knees. Second injection brings total peace. but wanting makes it so. at garden corner, where he scampered to peer indoors. and tears will never be enough. Anyone who has owned a pet and is an inveterate animal lover knows only too well the terrible feelings of loss and grief when a beloved pet dies or has to be put to sleep. This is a very personal poem, but one which I think pet owners can identify with and was written when the pain of loss was very raw and the grieving process had just begun. I just went upstairs for a minute or two and, when I came back down into the lounge, I wondered where Misty was. She had been out in her beloved garden for a few minutes & the weather was very cold and frosty. I heard funny noises under our dining table. I found Misty under a chair next to the dining table. Her legs were jerking & paddling, her head was arched back, she was having real difficulty breathing with her mouth open & was gagging. She lost of control of her bladder & then stopped breathing. Time slipped into slow motion. On auto-pilot I picked her up. She was floppy, lifeless & her gums were deep purple/blue, her eyes glazed. There was no heart beat or breaths. I checked her throat for obstructions. I blew up into her nostrils and massaged her heart. She lurched and gulped. I then put her on the sofa. Her heart began to beat very rapidly. I stroked her gently and she gradually began to have normal heartbeat rhythms after about 5-8 minutes. She had been having intermittent, occasional, short-lived breathing problems, where she gagged and had an asthma-like wheeze/cough. I took her straight to the vets, who confirmed a bad heart murmur (which she has always had, but I don't know if it had worsened) & he asked me to bring her in again in a week. I don't know if she had an actual seizure or it was more like a heart attack. I missed nearly everything that happened, because I was out of the room except for the last few moments. Misty is fine now & has never had a recurrence. She had a course of diuretics for a while. My vet said if I hadn't been there when this happened to Misty & did what I did to revive her, she would have died. In one of my cat books it does say what to do if your cat stops breathing, but I can't remember reading it. I'm sure I stored the knowledge subconsciously & used it in this emergency. I think we have a telepathic link with our pets (see Miffy's Story) & that is why I felt drawn to go into the lounge to see where Misty was. She needed my help & thankfully I was there to give it. * Sadly my lovely little Shadow was put to sleep on Wednesday 23rd September 2015 at 5.15pm. He was 9 years and 3 months old and had developed hind leg paralysis, couldn't hold himself up and deteriorated rapidly. He is buried under a garden Angel in the back garden in the back central border. I feel devastated and can't stop crying, but my dear friend, Annie, said I 'gave him a lifetime of care, comfort and love and that is a wonderful gift to have given to another living creature.' This has comforted me greatly. Shadow* - A New Arrival! Shadow arrived at our house on Friday 11th August 2006. He was born on 29th June. This delightful bundle of black & silver fur had come via a rather strange route. I had been driving to Mapperley Plains to do some shopping, when on the long, rollercoaster road from Colwick, I was passing the fields near Scotgrave Farm on Arnold Lane, when a wild rabbit shot out from under the hedges to the right into the oncoming traffic. I slowed down to a crawl & prayed this rabbit would hop in front of my car, but to my horror, he stopped, mesmerised, then shot back into the path of the car coming in the opposite direction. This car did not slow down. I don't know if he, or she, saw the rabbit, but the car, at a considerable speed, just ploughed into the rabbit, killing him. The only thing I can say about witnessing this awful event, was that it was a quick death. But I am appalled on car trips, how many dead animals I see on the road, including badgers, foxes, rabbits, hedgehogs & birds, plus domestic cats. Most people do not seem to slow down when approaching an animal in the middle of the road, leaving a battered, bloody body beneath their wheels. I was so upset at witnessing the death of this small, brown rabbit, that I kept thinking - what can I do? What can I do to help this situation? 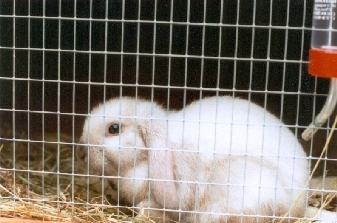 I had vowed not to have another rabbit after my last lovely rabbit, Honey, had to be put to sleep on 18th October 2002. I thought, I can give a good, loving home to a rabbit. I decided there & then to go to the pet shop near my mother's flat & buy a rabbit. I cuddled the small black furry rabbit I'd chosen. 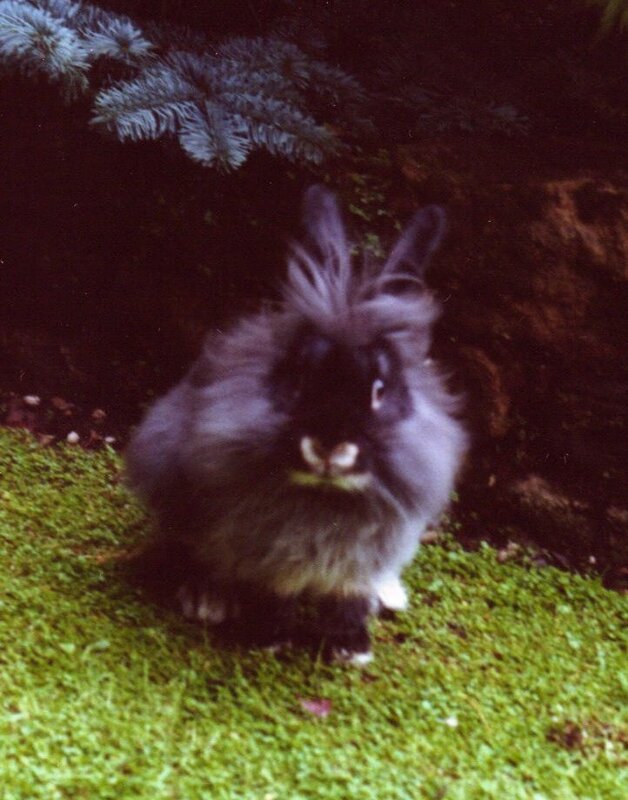 He was a Lion-Headed Dwarf rabbit about 8 weeks old with a fluffy ruff of fur round his neck & he licked & nibbled my blouse. I bought a two-storey rabbit Chalet with large living areas joined by a ladder & a large garden run. Tina, the shop owner, kindly delivered him in a special carrier within an hour together with hay, shavings, food bowl, water bottle, rabbit food & small animal disinfectant as a special package!! Shadow is very sociable & inquisitive & loves being combed & brushed, which has to be done daily, because of the long fur round his neck & back. He affectionately butts my hand & licks me & loves running circles round me making a funny honking noise. He expresses his joy of life by jumping & twisting in the air, dashing at high speed round his toys & in & out of obstacles. In the morning he rushes to greet me on the top storey of his hutch so he can dash out into the garden & his happy disposition lifts my spirits every morning. Mittens is a very special cat; he's a rescue cat. 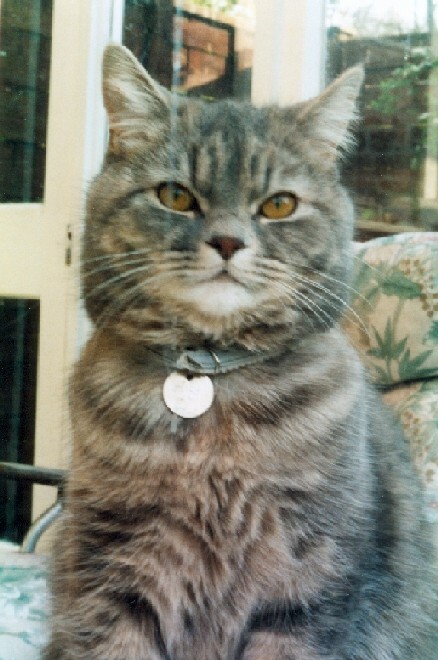 After Misty died in February 2006, I waited nearly a year before I had another cat. I decided I would like to rescue a cat & contacted Burton & Joyce Cat Rescue & Welfare & said I didn't mind a cat any age up to one year old, I loved bi-colour cats & would prefer a female. Brenda e-mailed me & put me in touch with Alison, who was fostering a male black & white cat about six months old. Brenda said he was adorable. I arranged to meet Alison to see if I would like to rescue him. On Friday 26th January 2007 I went to meet her & a beguiling young cat kept sitting on my knee, purring like a lawn mower, butting me with his head & staring at me with huge green eyes far too big for his small head. His wet nose kept touching mine when I put my head down & he wriggled enthusiastically on his back to be tickled, very much like Wrigley had done. I was smitten & I knew he was the cat for Ian & me. I instantly called him Mittens because of his very white front paws on his black legs. He also has long white socks on his back legs. Mittens had been found in a stable inside a horse blanket very near death from starvation & the lady who found him had nursed him back to health & handed him over to the BJ Cat Rescue & Welfare rather reluctantly, as she kept dogs. Mittens emerged from his carrier quite confidently & immediately began playing with the pom-pom on a string that I'd made for him, but a sudden noise made him dive under the sofa. He was soon lured out & began playing in earnest, then he discovered his activity centre!! He hasn't stopped playing since. We have named him the 'David Beckham' of the cat world after his dexterity with a ping pong ball and his super-trick is to leap in the air after a high-bouncing ball, control it and carry on dribbling around all the obstacles in his way. He had discovered he can play a version of Bagatelle by batting the ball under the linen bin in the bathroom and, because of the camber of the floor, it keeps returning to him for him to bat back. And then he has found that a ping pong ball in the bath provides endless playing permutations. After all this activity he loves lying next to you on the sofa & always includes your hand & arm in his cleaning rituals. Mittens and Shadow love playing together. 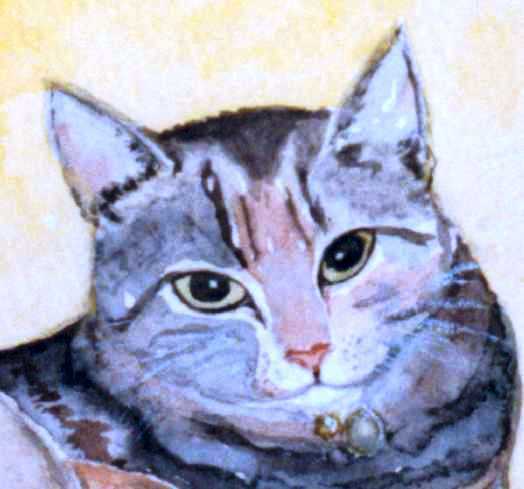 Mittens' birthday is 1st July 2006, so he is nearly the same age as Shadow. Mittens also loves his garden, chasing leaves, butterflies, bees & any bird that deigns to enter his personal domain. Food is always an issue. Whenever I am in the kitchen he comes charging in there, crying for food & leaps onto the breakfast bar, which he has requisitioned, to be stroked, kiss noses, purr & wait for his dish to be filled with the next delicacy. Every night he sleeps on his fleecy cat blanket on the end of our bed at my feet, waking in the night to meander up the bed for cuddles & strokes before tackling the great outdoors again. 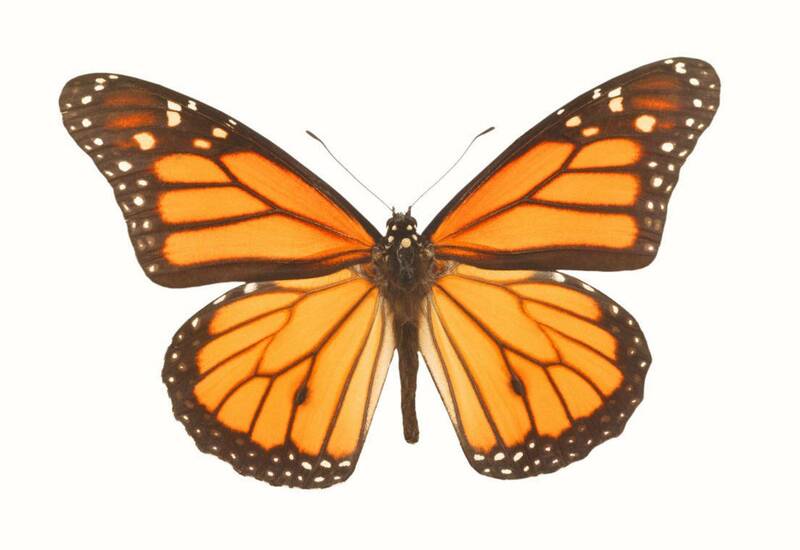 ♥ All stories, poems, artwork and photographs on this website are © Vivien Steels.